Adriatic coast of Croatia is famous for its rich cultural heritage and tourist potential, and it is very difficult to choose one city over the other when planning the visit. Although this area is primarily of interest during the summer months, my personal experience is that the city of Rijeka proves to be equally attractive for winter visits. Its mild climate will enable you to happily roam the streets in December, meeting large crowds of people and stumbling upon palm trees here and there. Therefore, do not wait too long before exploring this gem of Adriatic! Rijeka is the third largest city in Croatia, its biggest port and strategically important spot, populated by several different cultures through the ages. In the times of the Roman Empire, the coastal area was inhabited by the tribe Liburni, while at the hill above the Celts built their fortified city, Tarsatica. Roman conquest in the First century AD shaped these settlements into one municipium called Flumen, with its center moved closer to the sea and to the coast of nearby Rijecina River. The area was attractive to Slavic incomers, and Croatian tribes settled in the city probably by the beginning of seventh century AD. The fortification of Tarsatica, already rebuilt by Romans, underwent another reparation during the 13th century, when the first written historical records were made about the city. From this time onwards, it developed into the important mercantile and maritime center, divided into two regions. The one up the hill was dedicated to St. Vitus and consequently bore the name Flumen Sancti Viti. The sea coast became a home to a lively town of craftsmen, merchants, shipbuilders, sailors and fishermen, called Rika or Rijeka. Both settlements were ruled by many different states – Croatian, Hungarian, Austrian, Venetian, Italian, even Ottoman and French for short periods of time. Today they are united into one Croatian municipality, full of fabulous monuments built in different epochs. The crowded main street or “Korzo” is the perfect place to start the sightseeing and feel the vibrant atmosphere of the city. The mentality of your hosts will be cosmopolitan, welcoming, very polite and straightforward, which will make you comfortable with chatting, asking for directions, advices or anything you could need along the way. Down the “Korzo” you will encounter many beautiful facades, and one of them should especially catch your attention – the City Tower, with the City Gate, which stands at the place where Roman gate once welcomed the visitors into Flumen. The contemporary tower was built in the 18th century thanks to the donation of the Habsburg Empress Maria Theresa, while the clock dates from the 19th century. This pretty tower features the city’s coat of arms, as well as the reliefs showing Leopold I and Karlo VI, Holy Roman Emperors important for the city’s history. 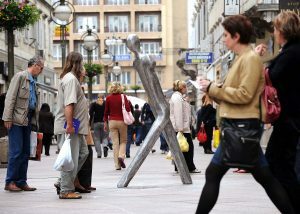 Observing similar facades dating from the periods of Baroque, Classicism, Art Nouveau, the visitor stumbles upon the contemporary sculpture “The Walker”, installed into the street, which makes the impression as if you’ve met someone friendly and already familiar. This awesome work of urban art is authored by Ivan Kozaric, academic sculptor, acclaimed in Croatia and abroad. Several fountains will be refreshing sights during your Korzo visit, one of them being the gift of Japanese city Kawasaki which is twinned to Rijeka. The fountain is dedicated to the youngest citizens and features sculptures of two children and a bird. When you get tired of sightseeing, you may want to take a break in some of the elegant cafes down the road. Espresso they serve is excellent and the staff is always friendly. Moving on, you may want to visit some of Rijeka’s beautiful churches. I must say that my personal favorite was The Capuchin Church of our Lady of Lourdes, Neo-Gothic building in red and white brick, very decorative and impressive. However, there is a tragi-comic story behind the fundraising for this building. Namely, the Capuchin order, who started the church in 1904, faced the lack of money and launched the news about the alleged miracle, presenting the crowd with the woman named St. Johanca, sweating blood. Many believers left donations, but the “saint” Johanca was proved a fraud and arrested in 1913. Despite this infamous chapter, the church was mainly finished by the end of 1920’s and is certainly worth a visit! Historically more important is the St. Vitus Cathedral, founded in 1638 by the Jesuits. Shaped as a rotunda, once upon a time it was connected with the Jesuit College and a seminary, but those buildings are not saved. The church interior is very beautiful, due to fine Baroque statues and interesting stained glass windows. It also possesses very valuable medieval Crucifix, made in the 13th century and restored in the 18th. There is a story of a miracle which happened when a desperate gambler threw a stone towards this Crucifix, once exposed in front of the church. Jesus’s body started bleeding, while the gambler was devoured by the ground which opened and closed to the amazement of the onlookers. The blood from the Crucifix was collected in an ampule and the cult developed around the object. The strongest cult, however, revolves around The Shrine of Our Lady of Trsat, where according to the legend, the original house of Virgin Mary was miraculously transferred from Nazareth. It happened in the 13th century, after which the house “traveled” to Loreto, Italy, where it stayed to the present day. This Trsat church is a place of pilgrimage and worship, visited even by the Pope John Paul II in 2003, whose statue was erected nearby in the 2005. Religious piety is only one of the possible reasons to endure the climb up the 561 steps of the Trsat Stairway. Others include sightseeing of the medieval castle, a stroll through Trsat Park built between the two World Wars, and beautiful view over the city of Rijeka. Observing it from above, you may want to make a list of places you should also visit during your stay. Apart from the places and churches already suggested, there are several interesting museums worth your time – Modern and Contemporary Art Museum, The Maritime and History Museum of the Croatian Littoral, or the Museum of the City of Rijeka. If you would rather go wild, “Ri Rok” festival of Rock’n’Roll is highly recommended! It was founded in 1979 and played an extremely important role in the creation of the Yugoslavian Rock, Punk and New Wave. Always open-minded and progressive, Rijeka cradled one of the most provocative and creative rock bands of the region, called Let 3. The video will speak for itself – enjoy!